Qantas A380 jumbo emergency landing - what was the reason? Qantas Airbus flew from Singapore had to come back after 15 minutes. Reason, one of the engine blew out. It is an Airbus with Rolls-Royce engine. Some people are saying that there was an explosion however Quantas official are denying that. But there is a big hole beneath the wing with a mark of smoke chute. We know the reason why it flew back but what made the engine to blew out, we do not know that.Was it due to fatigue on the blade? Or was it due to design error? Or a maintenance error? Or domino effect of all of them? After the engine's removal it was found that the turbine blades had separated from intermediate pressure rotors. The low pressure turbine bearing and adjacent phonic wheel and speed probes were destroyed and the intermediate pressure shaft was severed. Expert are saying it is an uncontained engine failure. Which means if turbine debris get into the engine,it makes to fail the engine. A long time back, an engine fell in south dakota from a flying aeroplane. Infact bolts they used did not have sufficient strength. So engine got loose from a flying plane. 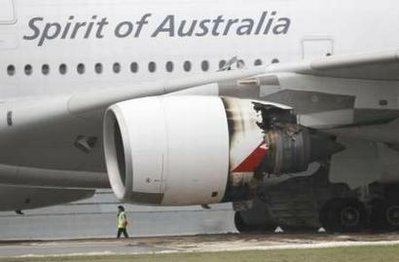 Engine did not fall off from Qantas plane. So this is not the case. However turbine got broken. It may be due to fatigue or it might have inferior material. It looks like pure mechanical failure. That means strength of the rotor blade was not enough to overcome the circumstance A380 faced in the Singapore sky. ( अब तिस मिनेट मा पसल बन्द गर्छु र साझ को पूजा गर्न जान्छु .